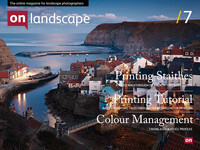 The author, Fran Halsall, teaches digital imaging at the Peak District Photography Centre and as such is ideally placed to capture the changing weather and light in the English Peak District. The Peak District National Park, the subject of the book, is a diverse environment full of photographic potential and easily visited by many of us due to its location nestled between Manchester & Sheffield, close to major trunk routes. It is this accessibility which has made it the most visited National Park in the UK. (which brings with it issues of environmental wear from so many walkers). Many National Parks have magnetic locations for photographers, places which have become iconic and as a result often over-photographed. Take Ashness Bridge in the Lake District as an example. Certainly, these views are well photographed for good reason, they are beautiful and I have to declare I am still trying to get my ‘own’ image of Ashness Bridge. (As landscapers are we ‘collectors’ of locations?) However, images of such locations can become diluted in their impact by such over-coverage. The Peaks stand out as different to me. It is hard to think of an iconic location in the Park. Certainly, there are places to where us photographers gravitate, Higger Tor, Mother Cap, Padley Gorge, Mam Tor, Stanage Edge and so on. But once at these places, each photographer seems to be able to find their own image rather than having a set of tripod holes to queue for. On good mornings Higger Tor can host several photographers but we each drift off looking for our own images rather than getting in each others way to get ‘THE’ shot. This brings with it wonderful challenges for us. There are fewer ‘easy’ compositions in the Peaks. We have to work for our images, but there is so much to work with. Rock formations, heather, ridges and peaks, farmhouses and dry stone walls, exposed copses and ancient woodlands. The diversity of the landscape provides endless compositional possibilities across the seasons. Autumn & winter, in particular are stunning as is the heather display in late summer. A good autumn days shooting in Padley Gorge is difficult to beat anywhere. The landscape suits those who shoot the wide expanses of moorland but also holds so much for those who like to make ‘found’ images of fine detail. With such a varied and challenging photographic area, many of us welcome books which might help direct us to locations with promise, especially if they give guidance on the best times of year to visit. Our time for photography amidst a hectic schedule is precious so getting the best from that limited time is vital to us. Hence I picked up Frans book with keen anticipation. What did I find? Would this be a good guide photographically to the Peaks or would it be another of those dreary books which end up in discount bargain book stores at shopping malls with mediocre images? The book is nicely produced and printed with pages roughly 10 inches (250mm) square. Fran gives us a brief history of the National Park (Britains first) and follows with a chapter on its varied geology and shows how this affects the look of the landscape. Included is a map of the various distinct areas of the Peak Park - The Dark Peak, The White Peak and the South West Peak (which perhaps ought to be known as the Mid-grey Peak?) and what character you will find in the landscape of each. She spends some time outlining how some areas of habitat are managed and also shows details about the woodlands, reservoirs, rivers and ancient landmarks that enhance the area. After a chapter about agriculture in the park she then sets about dealing with each area photographically.The book concludes with some suggestions as to further reading and technical notes on the photography (always useful). Fran is a competent photographer who has, over time, built up an extensive collection of images covering the area in some depth. As is inevitable when writing a book on a distinct area, not every image is going to be breathtaking. She obviously puts in the effort to get out when the light is good and this is reflected in her work, although many images are made in less than ideal light. It gives a sense of a photographer who puts her boots on, shoulders her rucksack of gear and sets off to explore. Some images get made in ideal conditions, while others taken during the day sometimes show less flattering light, but it would take decades of patient work to cover every location in perfect light. Amidst the images some are very good indeed and she shows a sensitivity to the landscape she so clearly loves from the way she writes about it and photographs it. She manages to capture the Peaks as they are, rather than showing an idealized view of them. For most of us the images will seem attainable rather than having the effect of making us feel we could never achieve such heights of photographic ability. Mainly, her compositions are open and capture the sweep of the landscape but in amongst them are closer ‘intimate’ landscapes. She seems to favor the use of a polarizer and also discusses at the end of the book how she favors making multiple exposures and combining them in Photoshop as opposed to using graduated neutral density filters to balance the dynamic range of an image. Her panoramic images she makes by stitching multiple exposures. I was struck by how few of the stone circles and other ancient sites there are in the Peaks that I knew about. Fran shows an intimate knowledge of these and their locations and has worked to photograph them all. They may not be as spectacular as Callanish or Castlerigg, but they still make very interesting subjects for landscape images. I didn’t know about ‘The Grey Ladies’ near Birchover or the ‘Nine Ladies’ on Stanton Moor or the ‘Five Wells’ chambered tomb on Taddington Moor come to that. For me as a landscaper, to be directed to such good subjects is worth the price of the book alone. I am pleased to see she doesn’t give GPS coordinates, exact directions and tripod holes for each image in. Rather she gives enough information for us to get a feel for places we would like to visit ourselves but leaving us in the dark just enough to make us then work to find our own image of the place. In this way it is a good guide to the Peaks and for me it has opened up many places I didn’t know existed and now want to photograph. If we couple the book with an Explorer OS map of the area, we are set up to get out there and make images. Our photographic press seems deluged with images and locations guides from Scotland and particularly from Dorset and Cornwall. (Partly because these areas are dripping with prime, stunning locations and probably for this reason the majority of the countries landscape photographers seem to base themselves down there, and then write about the areas as they are so familiar with them). This leaves areas such as the Midlands ‘under-covered’, even neglected by photographers and as the press. This book helps to restore the balance a little It will hopefully inspire many more photographers to get out and investigate this wonderful area and, as a result, might increase the coverage the Peak District gets in magazines. I have no hesitation in recommending it as a location guide and source of inspiration. On the other hand, do I really want ‘my’ Peak District invaded by loads of photographers with better skills than me? Do I want the tors and moorlands to be inundated with tripods much as Bamburgh beach at dawn is these days? (I can see them having to establish a ticketing system up there in the same way we queue at the deli counter in supermarkets in order to prevent riots as some selfish individual strolls down and plonks his tripod in front of everyone else's just as the light peaks - better stop, I can feel a rant coming on!) Perhaps I should have kept this to myself so I could enjoy this fine landscape in precious solitude?